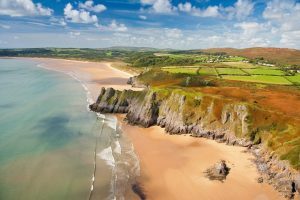 The Gower is one of the finest and unspoilt coastlines of the whole Wales Coast Path with its abundance of award winning golden beaches and natural beauty. 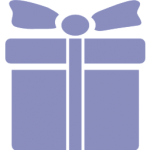 A short trail, only 43 miles long, consisting of numerous nature and wildlife reserves, Sites of Special Scientific Interest and Special Areas of Conservation. The area was also the first ever designated Area of Outstanding Natural Beauty. 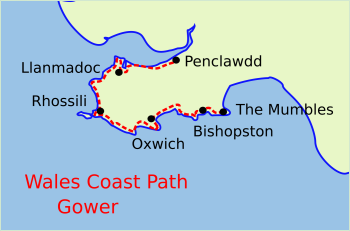 The terrain along The Gower Coast Path is diverse with a number of steep ascents up cliff tops and marshy landscapes which can be difficult in bad weather. Starting at Penclawdd, famous for its cockle industry, picked from the extensive beds of the Burry Estuary and sold at local restaurants and markets like Swansea. 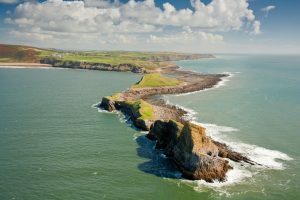 The dramatic and varied section following along the North Gower Coast combines dunes, marshlands, cliffs and forests passing small villages such as Crofty, Llanrhidian, Llanmadoc and Llangennith. A highlight along this part of the path is the Whiteford Point Lighthouse, one of only 2 remaining cast-iron, wave washed lighthouses in the world, the only one in the UK. Onwards down the coast to Rhossili beach, certainly one of the best beaches in the UK and in recent years, voted one of the top 10 in the world by Trip Advisor. Cross over to the promontory and iconic location of Worm’s Head, named for its resemblance to a resting dragon. The Gower offers the finest coastal walking in the UK and as the coastal path comes closer to The Mumbles and Swansea, look out for choughs and peregrines, guillemots, razor bills and kittiwakes as well as Atlantic grey seals. Lava bread, a traditional Welsh dish, made from boiled lava seaweed is synonymous with the Gower. Some of the accommodations will offer this delicacy as part of their breakfast menu! Close to the path in various areas, you can visit standing stones, ancient burial sites, medieval castles and churches.